In 1995, Apgar was inducted into the National Women's Hall of Fame in Seneca Falls, New York, where the women's rights movement began. Before her scoring system, prenatal problems and complications caused by the trauma of birth went undetected -- and killed or weakened countless newborns. Virginia Apgar was born in 1909. She first defied convention by getting a college degree, then did something few women had ever done: she enrolled in medical school. In 1933, Apgar became one of the first women to graduate from Columbia University with a medical degree, despite financial struggles during the Great Depression. Dr. Apgar had chosen the challenging field of surgery as her specialty, but she soon discovered it was closed to women. Ever the pioneer, she switched to an underappreciated area often delegated to nurses, anesthesiology. She found academic success, helping improve and develop the practice into an acknowledged medical specialty by the mid-1940s. Apgar became her alma mater's first female full professor in 1949, researching the uses and effects of anesthesia during childbirth. In 1952, Apgar made her most significant contribution to medicine. 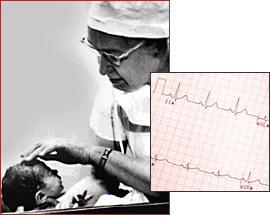 She developed the Apgar score, a system of rating the pulse, respiration, muscle tone, color and reflexes of a newborn baby. Her system of evaluating a newborn's health in the first, critical minutes after birth has saved countless lives and remains in use today. Apgar also founded a subspecialty field, perinatology, which is concerned with fetal health and complicated pregnancies. At age 50, Apgar started a second career, earning a master's degree in public health. As an executive at the National Foundation for Infantile Paralysis (March of Dimes), she traveled the world, raising awareness about birth defects, and money for medical research. She died in 1974.